Joint Base Lewis-McChord posted on their Facebook page that beginning Monday, May 1, the hours for Mounts Rd. Gate will be extended and open from 3 to 7 p.m. for outbound traffic to I-5, in addition to the Center Dr. Gate for access to DuPont from 3 to 6 p.m. JBLM is recommending commuters using the Mounts Road or Center Drive Gates to avoid the DuPont Gate back-ups. Recent changes at several railroad crossings in DuPont and Lakewood have caused traffic delays and some confusion about the upgrades. While the changes reduce the risk of collisions between trains, vehicles and pedestrians, we know it has been frustrating for drivers and residents. Drivers are waiting longer at signals before being able to drive through intersections. Though our intent is to reduce the risk of collisions, we understand the change hasn’t been as smooth as we would have liked and it caught some residents by surprise. A new traffic signal controller box is installed at the I-5 and Thorne Lane overpass in Lakewood. Our crews are working to identify possible solutions to this issue and we’ll keep residents updated on our progress. Upgrading signals and crossings reduces safety risks between drivers, bicyclists, pedestrians and train passengers by keeping vehicles from being caught on tracks as trains approach. During our design process for railroad improvements, citizens and city officials identified safety as the top priority for their communities. Starting this fall, all Amtrak Cascades passenger trains will be re-routed along the west side of I-5 through DuPont, Joint Base Lewis-McChord, Lakewood and Tacoma into a new Tacoma Dome station. This is one of 20 projects to improve passenger rail service and add two additional roundtrips daily between Seattle and Portland. Counting the national Amtrak passenger trains, 14 daily trains will use the tracks on the new route, traveling at speeds of up to 79 mph. That change required crossing and signal upgrades at Exit 119 in DuPont, as well as those at Berkeley Street, Thorne Lane, and Bridgeport Way in Lakewood. The Point Defiance Bypass rail improvement project includes adding new signals in DuPont at Exit 119. All of these locations have experienced longer wait times in recent weeks, but it’s particularly noticeable at Exit 119 in DuPont. 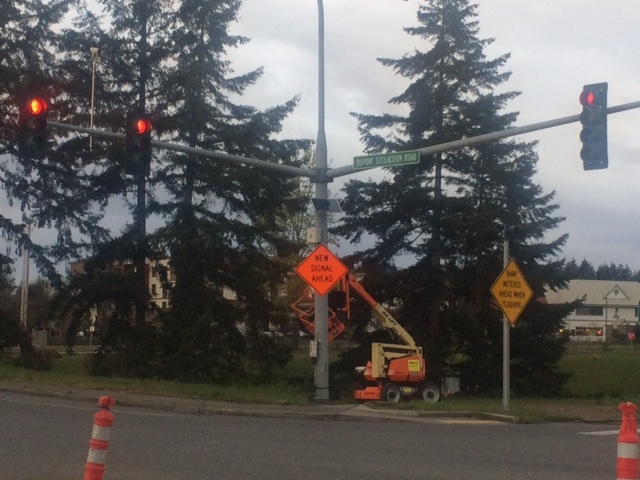 The signal upgrades synchronized all three signals at this intersection, allowing traffic to flow between the JBLM gate, the two highway ramps and the intersection of Barksdale Avenue/ Steilacoom-DuPont Road/Wilmington Drive. Motorists now must wait for the traffic signals to cycle through all three Exit 119 intersections, increasing the wait times for vehicles. The intent of this new configuration is to keep the railroad tracks clear of vehicles at each crossing, thus reducing the risk of collisions. While this configuration helps address the safety concerns we heard from communities, we understand the issues that longer wait times are causing. 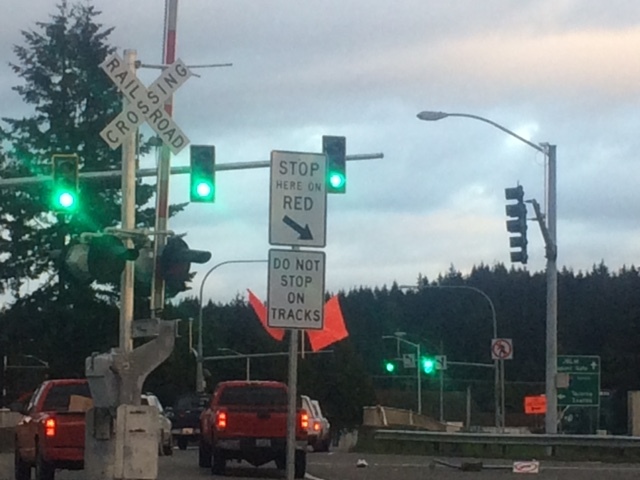 A new railroad crossing signal on Thorne Lane in Lakewood aims to keep traffic clear of the railroad tracks. We know the signal change is affecting daily commutes, as well as general travel in the area. We’re working with our partners, including Sound Transit, which is constructing this work, on identifying solutions. In the meantime, you may want to allow extra travel time through the area or consider any alternate routes available. 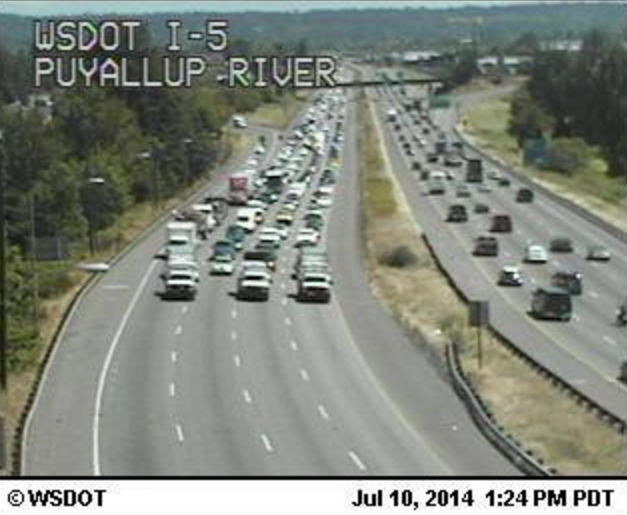 Some initial timing adjustments have already been made, but backups are still occurring, especially during rush hour. Our traffic and rail engineers are looking at other options, but with complicated, interconnected systems there isn’t an easy, overnight fix. We’re looking at possible sign changes at Exit 119 from southbound I-5 on to Barksdale Avenue to make it clear vehicles can turn right on red if the intersection is clear. We’ve also already changed the timing to keep the arrow “green” longer, thus easing some congestion. City leaders have been very proactive in identifying issues and proposing some solutions to help ease the congestion. We are keeping them informed of our work and we remain available to answer questions. 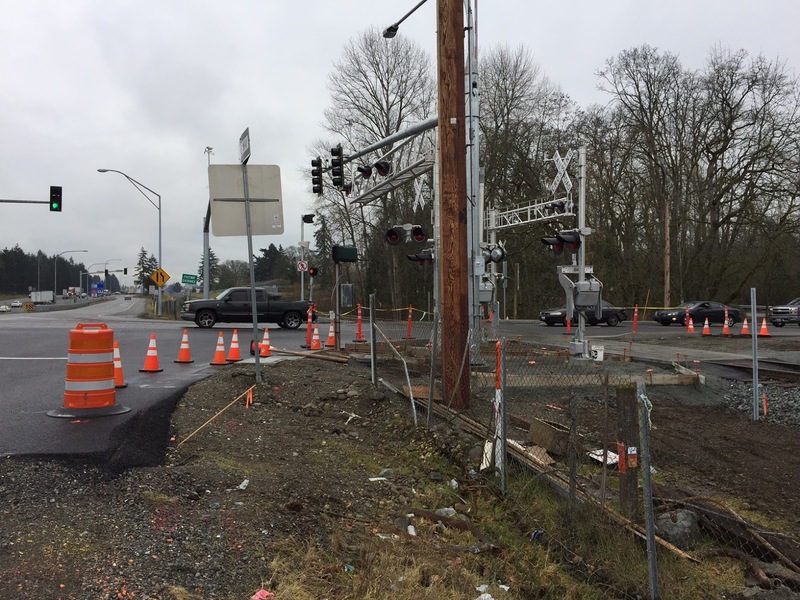 New signals and signage help to ensure safety as part of the Point Defiance Bypass rail improvements at Exit 119 in DuPont. Longer-term corridor improvements between Mounts Road and Steilacoom-DuPont Road, including the Exit 119 interchange is scheduled for 2021 – 2024 as identified in the 2015 Connecting Washington funding package. Obviously, this is still several years away and won’t help resolve this immediate concern. Despite the challenges, we remain committed to identifying and examining any adjustments or solutions that will reduce the congestion while still meeting the project’s safety standards. Despite the delays, please continue to obey all rail crossing signals. We know waiting can be frustrating, but the dangers at rail crossings are real. While passenger trains aren’t yet using these tracks, some freight trains do occasionally run this route. Additional train testing will also be taking place as we lead up to the new service this fall. Trains can travel in either direction, so even if you’ve seen one pass, the crossing isn’t safe until the lights and signal arms turn off. Trains often can’t be heard as they approach and are so heavy they can’t stop quickly, even if they do see someone on the tracks. We thank drivers for their patience during this adjustment. Change can be difficult, and sometimes includes some unexpected bumps in the road, but our overall work will help improve safety at these intersections. A few years ago my family and I were traveling through rural western Illinois on Interstate 88 when we came across a construction zone. The highway was reduced to one lane; the other lane and shoulder were torn up all the way down to dirt to rebuild it. This went on for 20 miles! That is one long, continuous stretch of roadwork to drive through, believe me. 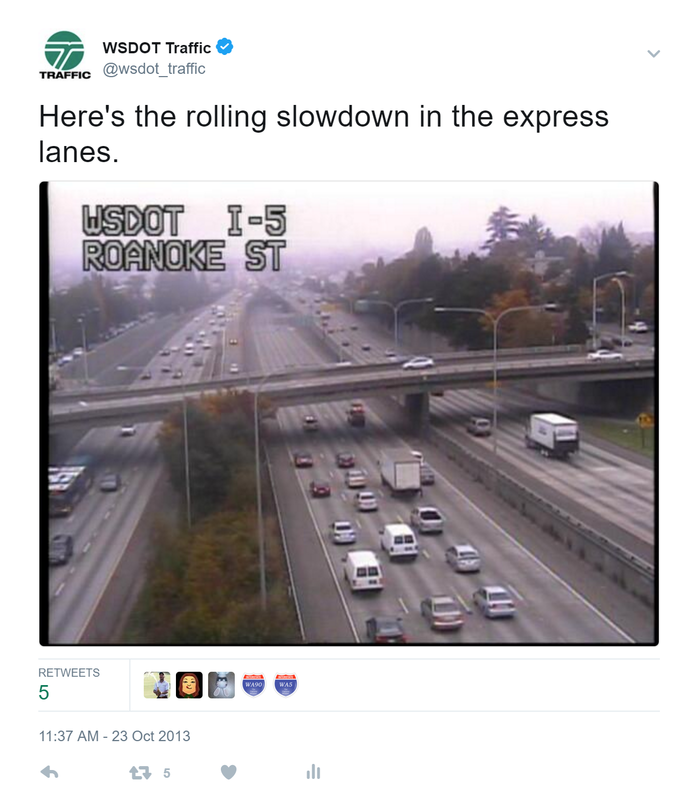 Well, we just started the first of two projects that will rehabilitate nearly 22 miles of northbound I-5 from Kent to the Ravenna neighborhood in Seattle and while it’ll take three years, don’t worry, we’re not going to reduce I-5 to one lane for months on end. Panel replacement: After the concrete panel is removed, the ground is compacted to provide a stable base for the new panel. Concrete panels will eventually break – hundreds have between Kent and the Duwamish River. To replace these, one night we use a big circular saw to cut the concrete. The next night we dig out the panels and pour new ones. In the past we’ve found we can typically do about three to six panels a night. It’s the same with the section between Martin Luther King Jr. Way and Northeast Ravenna Boulevard in Seattle. Along one three-mile stretch between the West Seattle Freeway and Seneca Street, all of the panels that aren’t part of bridges will be replaced. SB paving: After the concrete is cracked and seated (compressed), 8 inches of asphalt will be paved on top of it. In SeaTac and Tukwila, we have too many broken concrete panels to replace them individually – it would take years. Instead we’re going to repave with asphalt using a process called crack, seat and overlay, just like we did last year on southbound I-5 in the same area. This allows us to repave a large section much more quickly. If you put pressure on something for long enough, it’s going to wear away. That’s what car and truck tires have been doing to I-5 for more than 50 years. Now we have ruts in the concrete lanes, which can collect water and reduce traction. To get rid of the ruts, we grind off a thin layer of the higher, unworn part of the concrete, leveling the roadway. These metal connectors on bridge and elevated sections of the interstate allow the roadway to expand and contract as the weather changes. They wear out after a couple of decades. It’s better to schedule replacement during off-peak hours than have them break, say, in the middle of a peak commute, which requires emergency repairs. We’ll replace 37 expansion joints in Seattle, mostly between the West Seattle Freeway and Seneca Street, and eight at Interurban Avenue and the Duwamish River Bridge in Tukwila. The next several years will be a challenge as we #ReviveI5. In the end, we’ll have a lot of renewed interstate to see us through the next several decades. And unlike what I saw in Illinois, we won’t reduce I-5 to one lane for several months to do it. This is the second in a four-part series on highway preservation work starting this month on northbound I-5 from Kent to Seattle. Part one covers the history and development of these projects. On Saturday, April 29, we’ll launch a new version of the MyGoodToGo.com website. Not only will the site look completely different, we’ll also be launching a host of improvements to make Good To Go! work better for you. The original Good To Go! 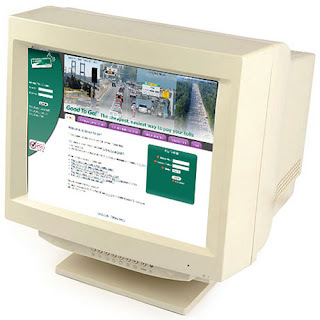 website was launched in February 2011. We all know how much technology can change in six years – back then VCRs were still being made and sold. We’ve come a long way and the time has come for us to unveil a new website up to date with today’s standards. For Pay By Mail customers, we’re providing a clearer summary of what you owe and when it is due. Managing your account will be much simpler, with fewer steps needed to update contact information or preferences. We’ve removed barriers that prevented users from completing certain tasks online, such as making a payment when you have a negative balance. We’re looking forward to unveiling this new site to you, but we’re still testing it to make sure everything works the way it should. We’ve been listening to the feedback you’ve provided over the years about our website and unfortunately, we weren’t able to address everything in this round of improvements. There are still things you won’t be able to do online, but all of our customer service representatives will be ready and happy to assist with anything that comes up. We expect our phones will get pretty busy next week, so remember you can always send us a private message on Twitter and Facebook for some quick help. Happy birthday to the new SR 520 floating bridge! 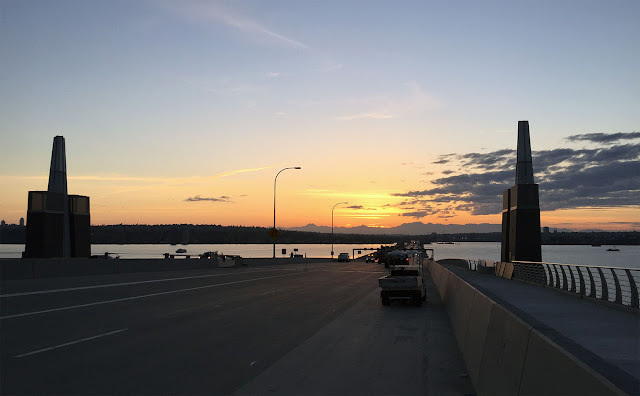 In the predawn hours of April 25, 2016, a few early-bird commuters made history when the new SR 520 floating bridge greeted their vehicles and opened to traffic for the first time. One year later, the new span – certified by Guinness World Records as the longest floating bridge on earth – is carrying about 77,000 cars, trucks and buses per day across Lake Washington. That's about 30 million trips over the past 12 months! The new, 1.5-mile-long bridge can boast other superlatives as well. On a clear day (yes, we have those now and again), the bridge affords breathtaking views of Mount Rainier to the southeast or the Olympics to the west. And with its Next Generation Concrete Surface, the bridge is also one of the quietest highways to travel on. Sunset over Seattle, looking west from the SR 520 floating bridge. Well over a decade of public discussion and planning about SR 520's future, followed by five years of construction by more than 1,000 workers, preceded the new bridge's historic opening. The result was a structure that will provide the Central Puget Sound region safer, more reliable travel for the next 75 years or more. The new bridge is bigger and stronger than its structurally vulnerable, four-lane predecessor. With more than twice as many pontoons and heavier anchors, it is designed to withstand much stronger winds and waves than its 1960s-era ancestor. The new bridge also has HOV lanes, which improves transit options, whether it's for daily trips across the lake to work or a weekend jaunt to events on either side of the lake. 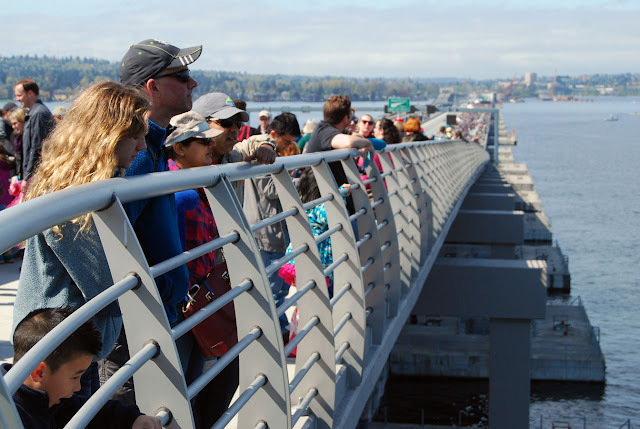 At the grand opening of the SR 520 floating bridge in April 2016, visitors experience the bicycle/pedestrian path for the first time. Another first is that travel across Lake Washington will be possible later this year for pedestrians and bicyclists thanks to a new 14-foot-wide bicycle and pedestrian path. In coming years, travel between the floating bridge and I-5 will experience a similar transformation. This summer the West Approach Bridge North is scheduled to open to traffic. This 1.2-mile-long bridge, supported by fixed columns, will carry SR 520's westbound traffic from the floating bridge to the eastern shore of Montlake. It also will extend the bicycle and pedestrian path across the lake. 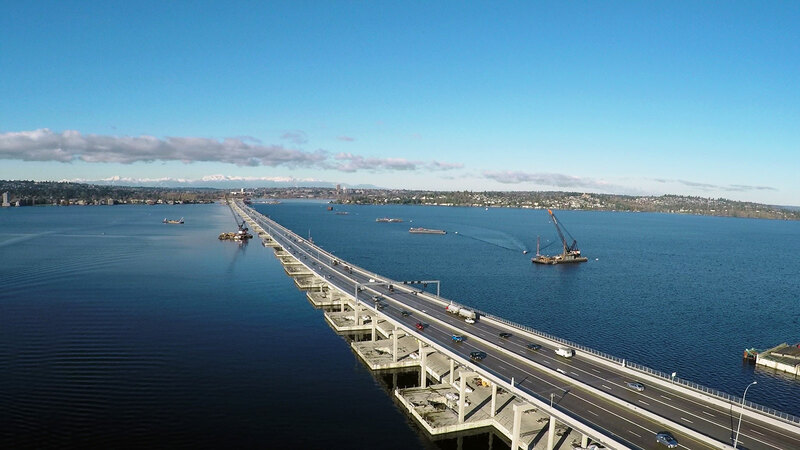 The new floating bridge carries six lanes of traffic across Lake Washington. In 2018, crews plan to break ground on the Montlake Phase, which will give rise to a partner bridge, the West Approach Bridge South, to carry eastbound traffic from Montlake to the floating bridge. 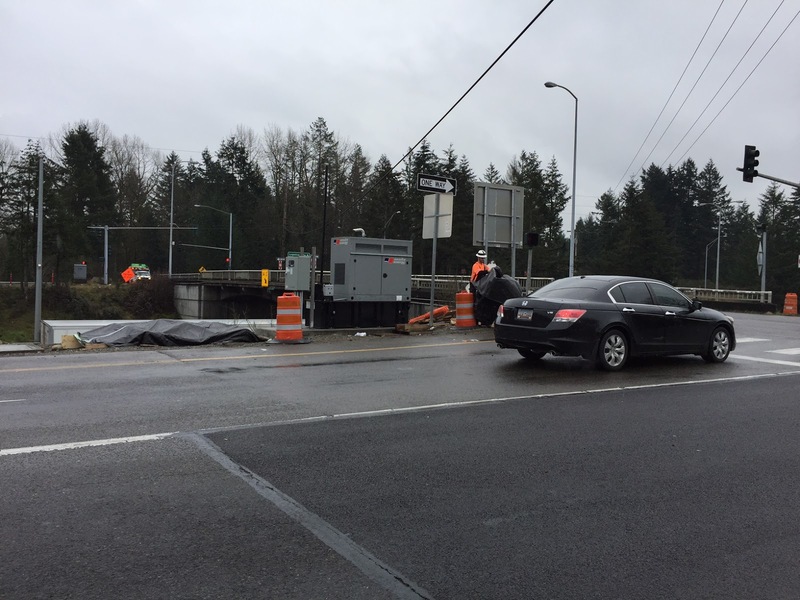 This project also will construct a landscaped lid over SR 520 in Montlake to further improve connections for transit, pedestrians and bicyclists. Approach Bridge North, scheduled to open in late summer 2017. 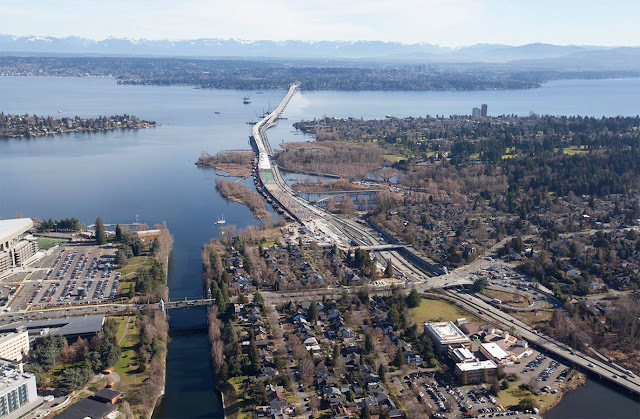 Looking to the next chapters of the story, teams are actively planning for the replacement of SR 520's Portage Bay Bridge between Montlake and I-5, and adding a second drawbridge over the Montlake Cut just south of the University of Washington. Want to learn more about the SR 520 floating bridge? Want to know more about the new bridge? Open this online booklet to find information on the background, planning, construction and opening of the new SR 520 floating bridge. 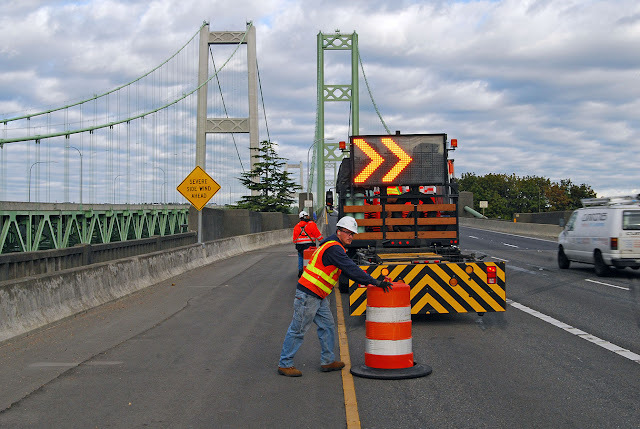 If you're hitting the road this summer, you're going to want to utilize our travel toolkit to help you plan and prepare for construction-related delays and closures along I-90. 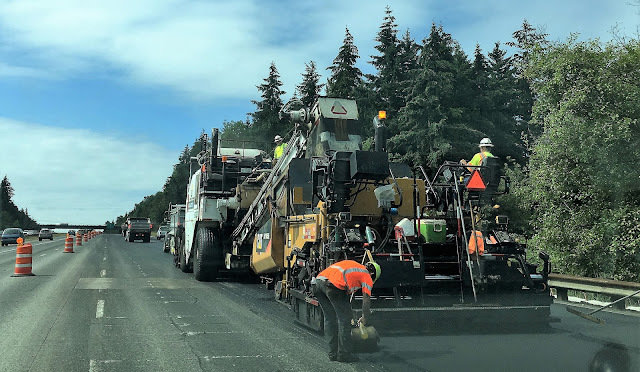 A number of road-improvement projects start this week and will continue throughout the summer as we build new lanes, build and repair bridges and fix cracked sections of pavement between North Bend and Ellensburg. resources drivers can use to stay updated on what’s going on. It's a difficult challenge as much of what we need to do requires dry weather, which on much of I-90 is tough to depend on outside of a few months in summer and early fall. Unfortunately that's also when people are doing a lot of their traveling, and it's a tough balance of needing to get this work done in a limited timeframe while also wanting to help people get where they want to go with as little delay as possible. We hope these tools will help. A new tool in our toolkit to alert you about delays, backups and closures on I-90 between North Bend and Ellensburg. Just text the phrase “WSDOT Snoqulamie” to the number 468311 to start receiving your text message alerts. Our What's Happening on I-90 webpage provides a day-by-day look of what construction activities are taking place and the location to help you prepare for delays and slowdowns. Follow us on Twitter @snoqualmiepass or @wsdot_east to find out the latest information about backups, delays and closures this summer. Every Friday we send email updates about the following week's traffic impacts on I-90 to help you prepare and plan your trip. Turn to your AM station and tune into 1610 AM or 530 AM while on the road to hear the latest information about construction-related delays and backups on I-90. Now that you have the toolkit, choose the best communications tool or tools to help you navigate across I-90 this summer. We are also teaming up with the Washington State Patrol to keep our work zones and you safe. You will see a lot more troopers along the I-90 corridor looking for speeders and distracted drivers. So please be safe out there for the sake of each other and all the road crews working to keep this important highway in good shape. Terry Dunn knows how quickly a life can change in a work zone. It took less than a minute for his whole world to turn upside down. by a work zone injury in 1995. 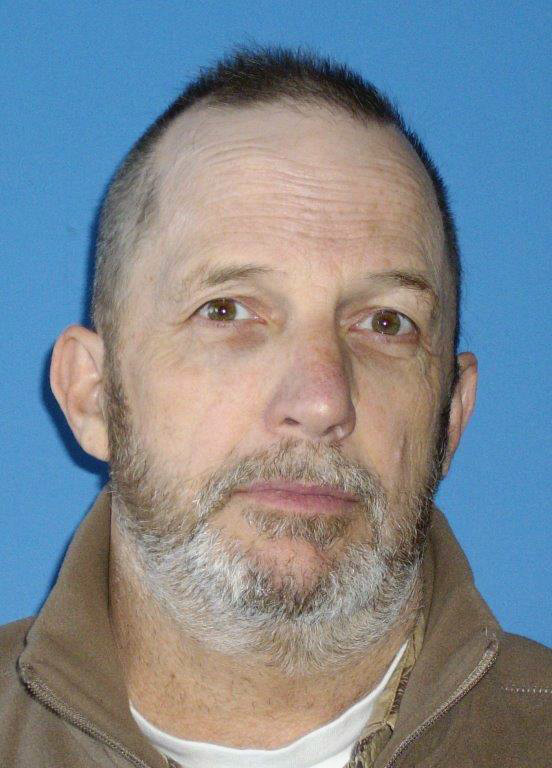 Terry was working as one of our asphalt inspectors near Colfax in the fall of 1995 when a contractor asphalt truck went into reverse through the job site. There was a spotter on site, but the truck moved so quickly Terry never had a chance to do more than turn around and see it coming at him. The next thing he knew he was pinned under the heavy machine while laying on top of fresh, boiling hot asphalt. He had burns, broken bones and nerve damage to his legs – and lots of pain. He remembers it feeling like someone was grabbing his toes and squeezing them with pliers. Even worse, he had a wife, an infant son and two adopted special needs children at home – and no idea how he'd take care of them. After six surgeries and lots of physical therapy, Terry was able to make a partial recovery, but his life and the life of his family has been forever altered due to the extent of his injuries. He returned to a desk job in utility permitting rather than construction, because he can no longer stand for long periods. He and his wife raised their children, adopting three more over the years, but he hasn't been able to coach his kids in sports or even play ball with them in the yard. The outdoor activities he loved, like camping and visiting fairs, also are a thing of the past. And he'll be on pain medication for the rest of his life. "It's impacted my life forever," he said recently from his Spokane office. "And I'm grateful for the recovery I had and the job I have, incredibly grateful, but injuries like that, they're with you the rest of your life." That's why work zone safety awareness is so important, and why we stress it not only for our work crews but also for passing motorists. Attention is rightly given to workers killed in work zones, but there also are people like Terry, whose injuries are far more extensive than they may sound in an evening news report. It has taken more than a year for road worker Greg King (left) to be ready to return to work after a 2016 work zone crash. Greg King knows that all too well. Greg was struck by a semi truck on Jan. 26, 2016, while flagging traffic near Aberdeen. He's hoping to return to part-time light duty work soon, but it has taken 15 months and back surgery to make that possible. King considers himself lucky to have survived. He knows just a few more seconds or inches could have caused a career-ending injury – or even death. "It's been a long road of recovery," he said recently at our Worker Memorial ceremony for workers injured or killed on the job. Greg's not a fan of the spotlight, but he agreed to speak at last year's ceremony and to be interviewed by news crews this year because he knows firsthand how crucial it is to raise awareness about work zone safety. "It's someone's life at stake," he said. "That could be your brother, your father or another family member who's out there working," adds Terry. "Treat it that way." Terry said he's not angry at the asphalt truck driver who backed over him and is glad to note that policy changes after his incident improved work zone safety. But workers still face dangers today, both from the very nature of their work as well as the vehicles passing just feet away. Terry hopes sharing his story will remind both his fellow workers and drivers about work zone dangers and what they can do to help keep everyone safe. Most work zone crashes are completely preventable by just slowing down and being extra alert. "No one drives through a work zone thinking they're going to hit someone," Terry said. "They're thinking they're now 15 minutes late for whatever and don't think it will happen to them. But everyone out there has a family, has kids, has parents that they go home to at the end of the day." 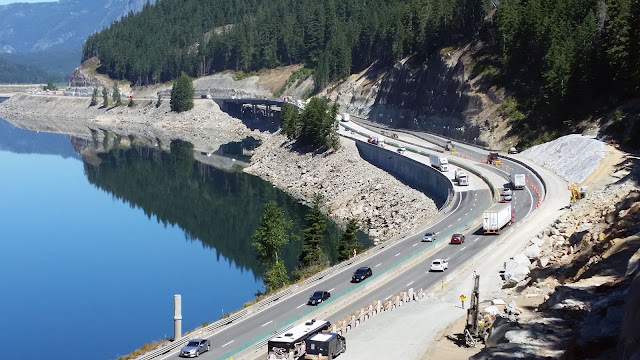 This is the first in a four-part series on highway preservation work starting this month on northbound I-5 from Kent to Seattle. It's been a while since it cost just 5 cents for a first-class stamp, 50 cents for a gallon of milk and $20,000 for an average home. Back in the early 1960s, color television was making its debut, Seattle's newly-built Space Needle was the tallest structure west of the Mississippi River and construction of Interstate 5 through King County was in full swing. Much has changed since then, but the driving surface of I-5 through Washington's most populated area isn't one of those things. Sure, we do regular inspections and preventative maintenance work, but we haven't done a full-blown rehabilitation. 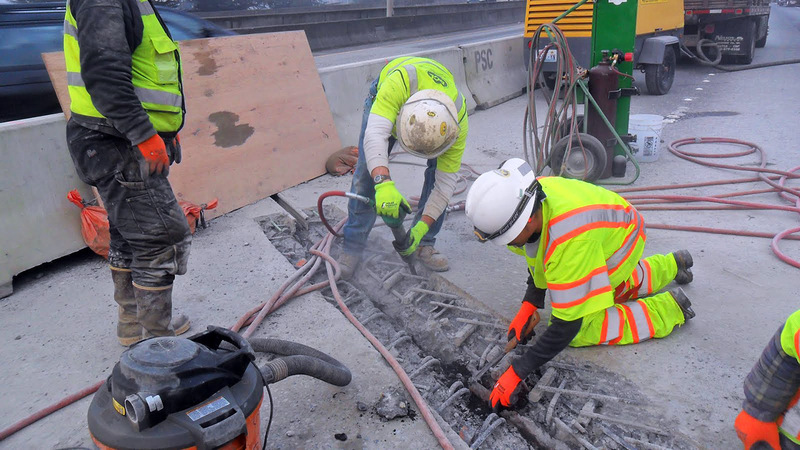 Well, northbound I-5 from Kent to Seattle is about to get a much-needed extreme makeover as we replace much of the pavement and fix dozens of aging expansion joints. When this 38-mile stretch of I-5 opened in 1965, I'm not sure anyone imagined that the concrete pavement would survive largely untouched for more than 50 years. Whether it was the type of cement used, the amazing work of its builders or our regimented upkeep, one thing's for sure – the freeway is outliving its expectations, possibly by decades. No matter how well you take care of something, almost everything has a lifespan. You can repaint sections of your house as needed, but one day you'll need to repaint the whole thing. That's where we stand with I-5. Despite repairs on several sections of concrete and the replacement of many expansion joints, the time has come for a major overhaul. 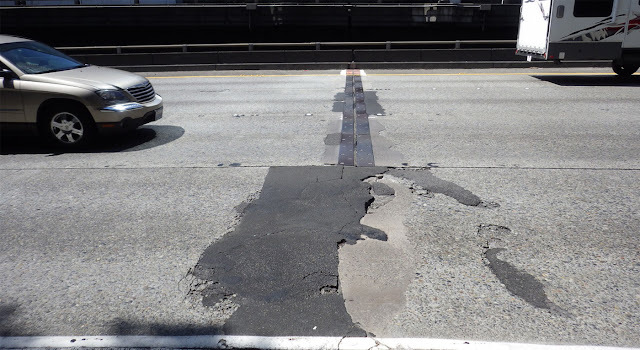 repairs, the driving surface on this section of I-5 has held up for 50-plus years. As many as 236,000 vehicles use this corridor each day. More than half a century of heavy traffic and Pacific Northwest weather have taken their toll. Much of the driving surface is worn out. You can feel it – from the bumps where concrete panels are broken to the backups caused by lane closures from aging expansion joints popping up. The signs are pretty obvious. I'm sure you're asking, “Why didn't you do something about this earlier, before we got to this point?” That's a fair question. It all comes down to timing and available funding. 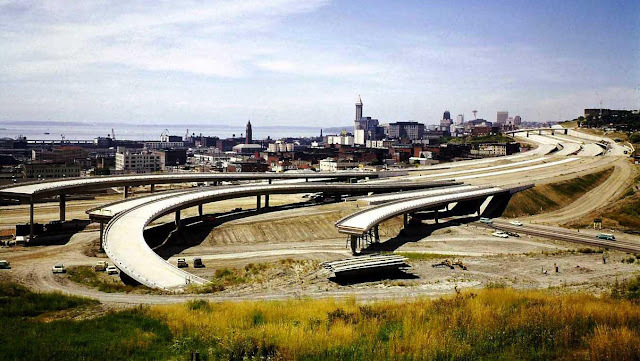 Although much of the Interstate Highway System in Washington state was built around the same time, each section of freeway is aging at much different rates depending on wear and tear from traffic and weather. We tackle the worst spots first using a set amount of funding we receive each year from the legislature for highway preservation projects, like our recent pavement work on southbound I-5 from Tukwila to Federal Way. Emergency repairs such as expansion joint work have caused some traffic nightmares on I-5 in Seattle. Between waiting for funding and juggling construction schedules that are carefully timed around the dry season, special events, other projects and hundreds of thousands of commuters, some corridors end up waiting longer than we'd like before getting some love. In those cases we do the best we can to maintain the road as well as possible with temporary fixes. 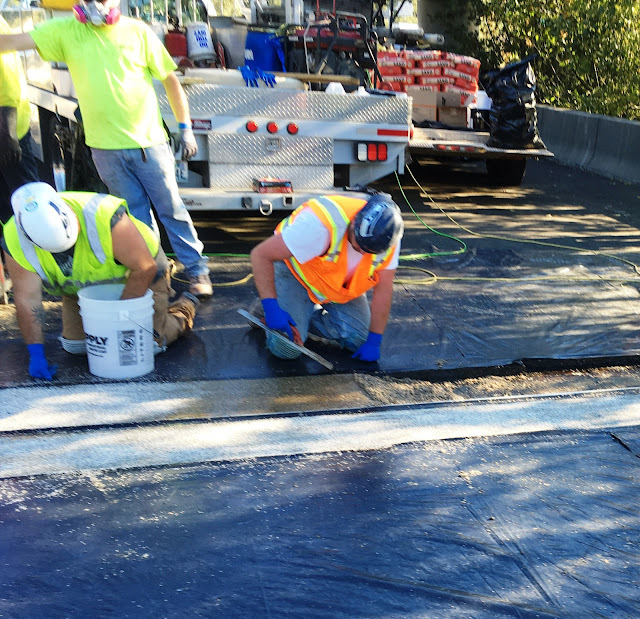 This month, our contractor crews begin a multi-year project to rehabilitate the driving surface of northbound I-5 from Kent to Seattle. This is a huge undertaking that we expect to last 2-3 years. Some work will require weekend-long lane reductions – a cost many of us will have to budget into our lives in order to avoid huge backups while keeping the corridor safe and sound for the next 50+ years. We want to thank commuters in advance for adjusting around what we know will be some rough commutes… because we all know, traffic volumes are not at 1960s levels, along with just about the cost of everything nowadays. 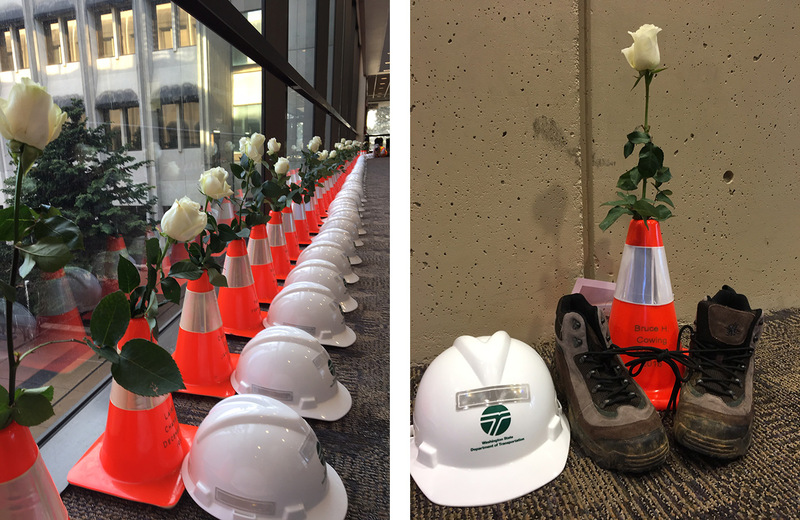 This morning 60 orange traffic cones, 60 white helmets and 60 white roses line the lobby of our headquarters building in Olympia. They appear every year on the day of our Worker Memorial honoring the workers killed or injured on the job. But, no matter how many times you see them, it's still a sobering reality check about the dangers many of my co-workers face on a regular basis. Each cone bears the name and date of one of our workers killed while doing their job. The list stretches from 1950 (the last year we have good records) into modern day. Each one represents someone's parent, spouse, sibling, child or friend who never made it home from what started as a normal day of work. Some of their loved ones will join us at the ceremony this year in what is always one of the most humbling and moving parts of the day. Left: This row of cones, hard hats and roses represents each of the 60 WSDOT workers killed on the job since 1950. Right: A new cone was added this year, for Hood Canal Bridge worker Bruce Cowing, who died May 16, 2016. A pair of empty boots is included to signify our missing worker in the first year since his death. Today's event is especially solemn as we remember Bruce Cowing, a Hood Canal Bridge maintenance worker who died May 16, 2016, near the end of his shift. The Washington State Patrol investigation determined Bruce momentarily lost control of his truck and accidently drove off the bridge. His death highlights how easily a family's world can change in an instant. Bruce is the 60th name on our Memorial Wall, which will be unveiled during the ceremony. It's a list we never want to increase. We hope today's event is the last time we add a name to this wall – but we need your help. The top three causes of work zone crashes on state roads are distracted driving, following too close and speeding. These are all avoidable. They're also all actions that put everyone on the road at risk. Statewide, 96 percent of the people injured in work zone crashes are passing motorists, their passengers or pedestrians. 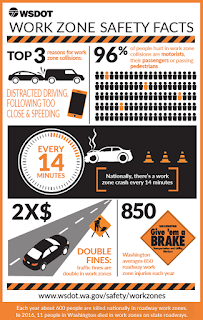 Eleven people died in work zone crashes last year in Washington and another 523 were injured. It's in every drivers' best interest to be extra alert in work zones – your own life could depend on it. We're spending the month sharing information and tips about how to help keep everyone safe in work zones. We're also sharing messages from our workers, asking drivers to slow down, pay attention and give them the space they need to improve or repair roads, bridges and ferries. You may not get to see the cones, speak with family members or attend our ceremony today. But please keep our workers – past and present – in your thoughts when you're driving. We want to see everyone return home to their families every day. 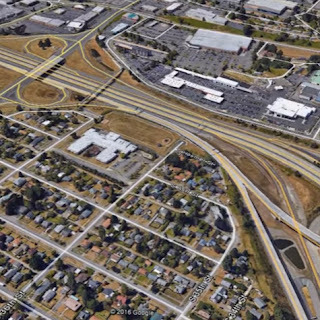 Good news for travelers on northbound Interstate 405 in the south Snohomish County area: In less than two weeks, you'll have a new option for your afternoon commute. At 2 p.m. Monday, April 24, the I-405 northbound peak-use shoulder lane will officially open to general-purpose traffic on the 1.8 mile stretch between State Route 527 and I-5. Between now and then, we're wrapping up our testing of the new electronic signs that will control the lanes, so you might still see some test messages, symbols and colors as you drive through the area. 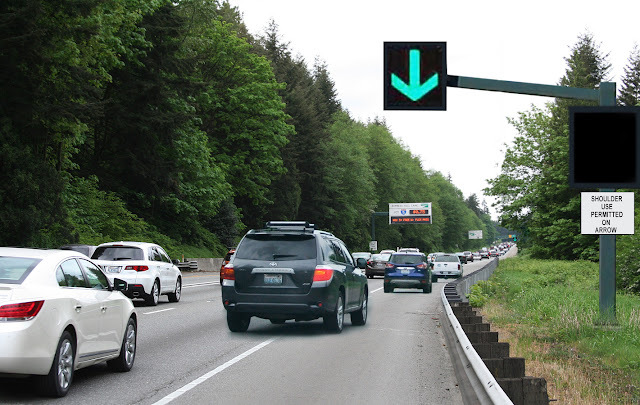 A green arrow like this will indicate if the new I-405 peak-use shoulder lane is open to traffic. Originally, the Washington State Legislature funded this project with an expected opening date in 2018. However, with approval to use revenues from the I-405 express toll lanes earlier, we were able to complete the project more than a year sooner than expected. 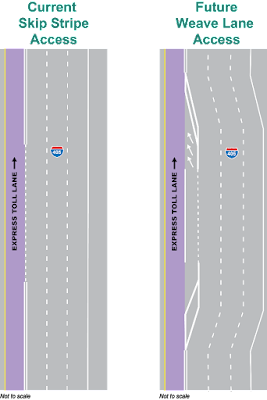 How do I use the lane? As the name suggests, general-purpose traffic and buses will now be able use the northbound right shoulder as an additional lane during times with the heaviest congestion—in this case, the weekday afternoon commute. That means there will effectively be three regular lanes and one express toll lane in this area. The peak-use shoulder lane will generally be open during the afternoon peak period but will be dynamically controlled, so be sure to check the overhead electronic signs before entering the lane. A green arrow will indicate that the lane is open, and a red "X" will indicate that the lane is closed, similar to the signs you see today on I-5 near downtown Seattle. To learn more about what you might see on the signs, check out our previous blog on the subject. During off-peak hours and weekends, the shoulder will remain closed so that crews still have space to perform maintenance and law enforcement and emergency services can use the shoulder as needed. As with all highway operations, our traffic management center will be actively monitoring the shoulder lane. If there is a collision or incident, we will be able to close the lane in order to allow emergency services to respond. 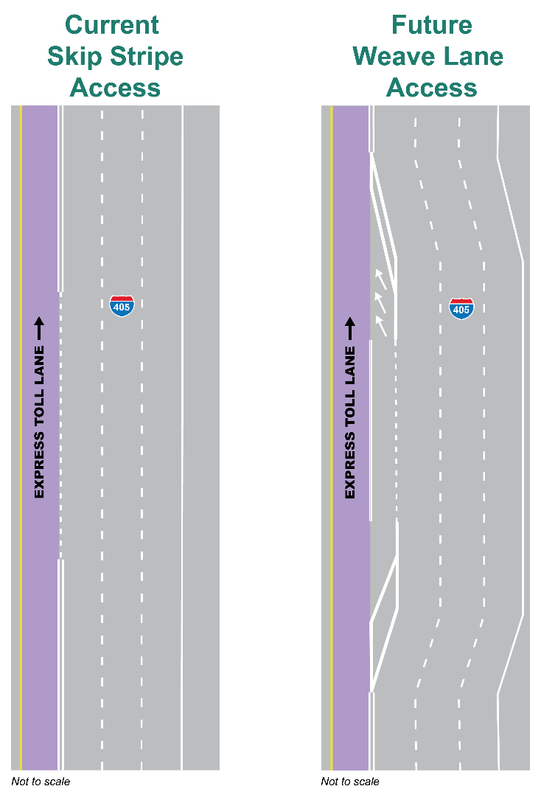 There will also be four paved emergency pullouts in the area of the peak-use shoulder lane. Although this is the first electronically controlled shoulder lane of its kind in the area, you may have noticed that US 2 in Snohomish County also allows traffic on the shoulder during specific hours indicated on posted signs. For more information on other peak-use shoulder lanes in the region, check out the WSDOT congestion page. Why did we add a lane in this area? 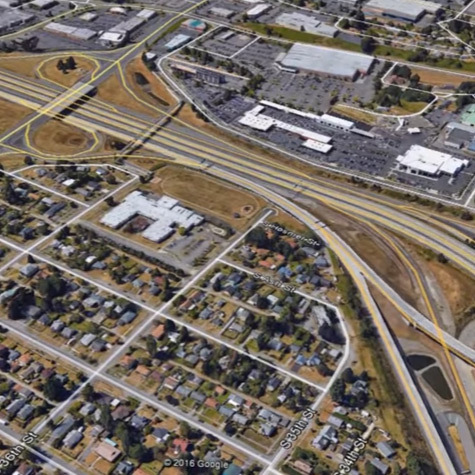 There have always been northbound bottlenecks at the SR 522 and SR 527 interchanges because we simply don't have enough lane capacity to handle the huge growth that south Snohomish County has been experiencing. At the SR 527 interchange, an estimated 1,000 vehicles an hour enter northbound I-405 during the afternoon commute. For perspective, that's more than two full Kirkland Costco parking lots emptying on to northbound I-405 from SR 527 every hour. The peak-use shoulder lane will offer a new place for some of those vehicles to go without needing to merge directly into the already crowded I-405 lanes. As a result, most trips between Bothell and Lynnwood on northbound I-405 are now slower during the afternoon commute than they were before express toll lanes. The peak-use shoulder lane is just one of several identified improvements that we have been able to make over the past year and a half based on driver feedback. We'll be closely monitoring how the peak-use shoulder lane affects traffic in the coming months, but we know that this area of I-405 still needs more help. That's why we're continuing to look at how to fund and build additional improvements between SR 522 and I-5, including extending the second express toll lane farther north and improving the SR 522 and SR 527 interchanges to help traffic move more smoothly. The Legislature gave us initial funding in the 2016 budget to study these improvements, and the governor's budget for next year includes $5 million more to continue our engineering. Especially with Sound Transit planning to launch a new I-405 Bus Rapid Transit system from Lynnwood to Tukwila by 2024, we know it's critical that we help keep traffic moving and provide travelers with a more reliable trip option. In short, the peak-use shoulder lane isn't the end of the road—it's just the start of what we hope will be a series of big improvements for the north end of I-405. It’s a sad irony that we’re spending this month recognizing the importance of work zone safety when we had a close call this past week that could have turned deadly. 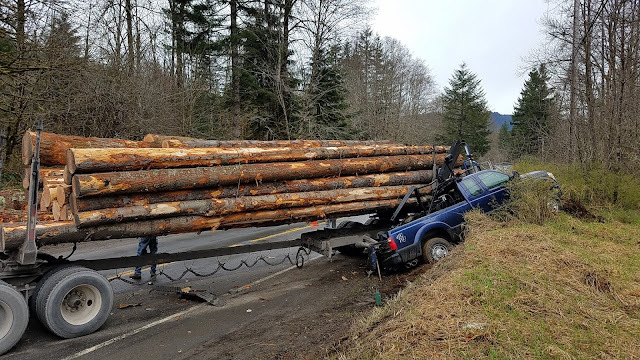 Several members of our maintenance crew were alternating traffic on SR 7 near Morton to patch potholes when a fully-loaded log truck blew through the temporary stop signal and crashed into one of our vehicles in the work zone. 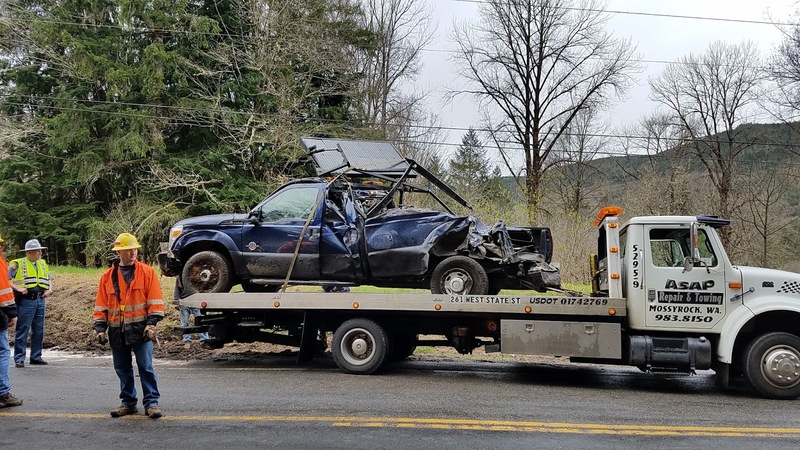 The pickup truck that was struck was displaying one of our reader boards about the lane closure, and was parked as an additional barrier between traffic and the workers. Fortunately, our crew members escaped this crash in an SR 7 work zone without any serious injuries. One of our crew members went to the hospital for further evaluation, and we’re grateful the injuries weren’t serious. The Washington State Patrol is investigating the incident and will determine what citations the driver may face. This is why it’s so important that we continue to push the message about work zone safety. We see far too many of these situations throughout the year. While we do what we can to create as safe a work zone as possible, we need help from the traveling public to ensure everyone goes home at the end of the day. into one of our vehicles in an SR 7 work zone near Morton. So please, we continue to ask you to always pay attention on the highway, adhere to road signs warning of lane closures, slow down and give road workers room to get their job done. State Route 530 near Oso reopened at 2:26 p.m. Wednesday, April 12, following an emergency closure due to an unstable slope above the highway. Over the past weekend, crews installed 11 monitoring locations to track ground movement and analyzed the hillside twice a day. After several days of no measurable movement to the slide area above SR 530, geologists from the Department of Natural Resources (DNR) and the Washington State Department of Transportation (WSDOT) have decided to reopen the highway. Snohomish County officials have also lifted the voluntary evacuations for residents near the slide area. While the highway has reopened, WSDOT will continue to monitor the slide area. No movement noted this morning on the SR 530 slide area. WSDOT crews found no active slide movement on the slope this afternoon. Another update will be provided Wednesday morning. This morning, WSDOT crews found no active slide movement on the slope. This afternoon, WSDOT crews found no active slide movement on the slope. Our crews will continue to monitor the hillside, and will provide another update Tuesday morning. This morning, WSDOT crews found no active slide movement on the slope. We will continue to provide updates twice a day as our crews continue to monitor the hillside. 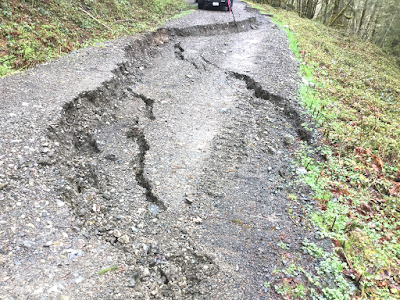 State Route 530 near Oso will remain closed to drivers until at least Thursday, April 13 due to an unstable slope above the southwest side of SR 530. The road is closed between Oso Loop Road (MP 34) and C-Post Road (MP 38). The closure began on Friday, April 7. WSDOT geologists have spent the past two days analyzing data, and tracking movement of a slow moving landslide approximately 300 feet above SR 530. While no additional movement was detected, geologists believe the slide still has the potential to move. Geologists want additional time to observe the slide area before the highway can be reopened to traffic. "If the entire 24 acre slide were to give way, it could completely cover highway 530 and potentially reach Whitman Road," said Assistant Regional Administrator Dave McCormick. "We know this is huge disruption to the lives of those who live and work in the Stillaguamish River Valley, but there's still a heightened risk that this slide could still move." 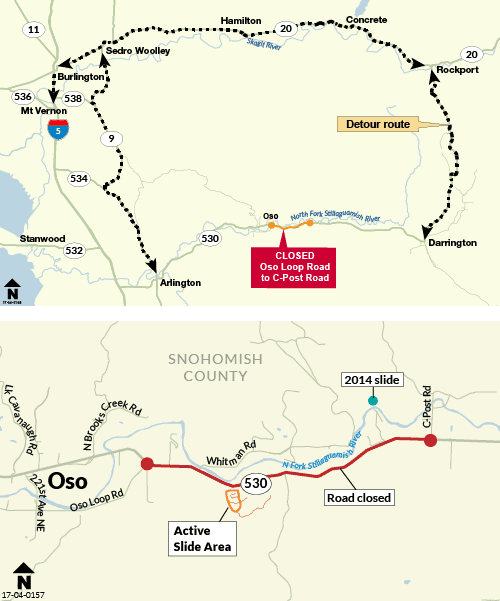 During the closure, drivers who need to travel between Oso and Darrington must use SR 20, which will add at least one hour to a one-way trip. Emergency vehicles and property owners inside the road closure will be allowed through the area. During survey work on Saturday, April 8, geologists with the Department of Natural Resources (DNR), WSDOT and representatives from Snohomish County, the Snohomish County Sheriff's Office and Seattle City Light observed and mapped areas of movement within a previously known landslide. Geologists also installed 10 monitoring locations to track ground movement. The slide is located approximately 1.5 miles southwest of the 2014 SR 530 landslide. A voluntary evacuation notice issued by the Oso Fire Department and Snohomish County Sheriff's Office to approximately a dozen nearby homes remains in effect. 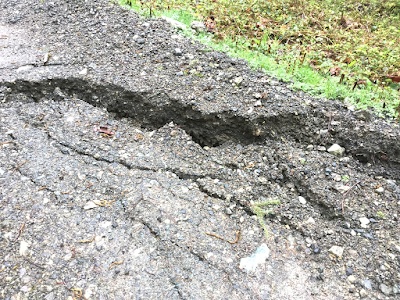 On Monday, April 3, crews working for WSDOT were notified about ground movement near Montague Creek along the south side of SR 530 and approximately a half-mile from Skaglund Hill. On Friday evening, April 7, DNR crews observed additional ground movement at the site. Heavy rains most likely contributed to the ongoing ground movement. While this is a slow moving slide, DNR and the Washington State Patrol asked WSDOT to temporarily close SR 530 as a safety precaution. DNR, WSDOT, Oso Fire Department, Snohomish County, Snohomish County Sheriff's Office and the Washington State Patrol will continue to work together over the next several days while the highway remains closed and ground conditions are closely monitored. 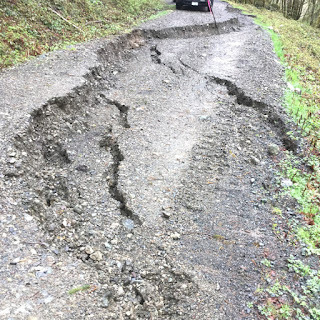 State Route 530 near Oso is expected to remain closed at least until Monday morning while crews from the Department of Natural Resources and WSDOT monitor a hillside where ground movement was detected earlier this week. The slow moving slide was discovered on Monday, April 3. On Friday evening, April 7, DNR crews observed additional ground movement in the area, likely due to heavy rains, and asked WSDOT to close SR 530 as a precaution. The Oso Fire Department issued a voluntary evacuation for about a dozen homes near the slide area. The slow-moving slide itself is on a private forest access road on the south side of SR 530, and approximately 1½ miles southwest of the 2014 SR 530 landslide. SR 530 is closed between Oso Loop Road (milepost 34) and C-Post Road (milepost 38) as a safety precaution. The detour is using SR 20 and I-5. At a minimum, the highway will remain closed through Monday’s morning commute. This will allow geologists to monitor the hillside through the weekend and keep drivers safe. If they notice additional slide movement, the highway may remain closed longer. Geologists will observe possible land movements like this crack above SR 530 through the weekend. to close the highway as a precaution while crews monitor the situation. I get it. I don’t like sitting in traffic either. But sometimes there’s a need for a specific tactic that may have me tapping my breaks and slowing down on a state highway for a little while in order to keep us all safe. I’m talking about the rolling slowdown. What is a “rolling slowdown”? You may be asking yourself, what on earth is a rolling slowdown? Don’t worry, I didn’t understand that term until I recently starting working here. Rolling slowdowns are when Washington State Patrol troopers or our Incident Response Team crews drive in front of traffic with lights flashing as they gradually slow everyone down to a crawling speed. The trooper or IRT will then slowly guide traffic until the incident or planned maintenance work has cleared. Once it’s finished, the trooper or IRT allows traffic to get back to its normal traveling speed. Recently we’ve had rolling slowdowns on I-5 in north Seattle while Seattle City Light strung power lines over the freeway, and another on I-5 in Bellingham while we did emergency pothole repair. 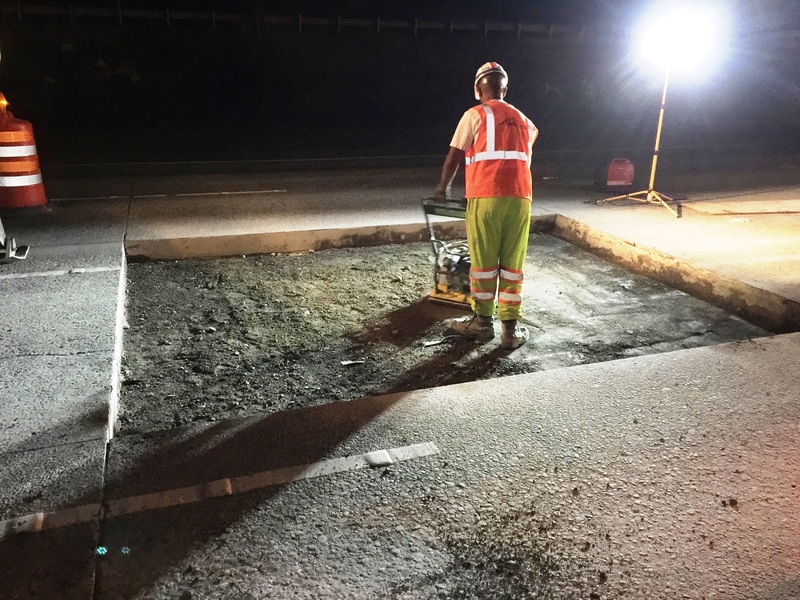 Those are the kind of jobs where you don’t want vehicles buzzing by you at 60 miles per hour, and in the case of the Bellingham work we were able to patch the hole in about 15 minutes. Why not just stop traffic? So what’s the point of just slowing down traffic instead of stopping it completely? Believe it or not, stopping traffic is actually more dangerous. Imagine you’re traveling down the freeway at 60 miles per hour when all of a sudden the traffic in front of you is completely stopped, forcing you to slam on your brakes to avoid a nasty collision. Something like that is definitely going to stop traffic, likely for quite a while as emergency crews respond to the crash. Rolling slowdowns, on the other hand, have proven to significantly reduce the risk of rear-end collisions because they allow traffic to decelerate to the same speed as the vehicles in front of them, instead of having to stop abruptly. Rolling slowdowns also usually allow traffic to continue moving – albeit slowly. Generally, rolling slowdowns add about 15 to 20 minutes to your trip at most, and ideally, traffic is never completely stopped. For example, say we had to close a lane of I-90 through Snoqualmie Pass to clear debris from the road. The traffic delays from closing that one lane could make your travel time significantly longer, as much as 1 to 2 hours during heavier traffic periods. We would have to send out an IRT truck to stop traffic while crews lay out barricades and any other equipment they might need. Once that is set up, then they can finally remove the debris, clean up all their equipment and remove their barricades or traffic control devices. This work often doesn’t take more than 20 minutes but in that time, traffic can back up several miles depending on traffic volume. If we used a rolling slowdown to clear the debris, only 5 to 8 minutes typically would be added to your travel time, and you and our workers would be safer. That seems like a pretty fair trade, don’t you think? We know that any time we slow down or stop traffic, it’s an inconvenience but please remember that it’s always done for your and our safety. So if you see a trooper or one of our trucks or crews out there on the road, be sure to take the time and give them room to work. Remember, it’s illegal and unsafe to pass an emergency response vehicle while its lights are activated and you are being slowed down, so please be patient. The safer road crews feel, the better and quicker they can do their work. A dramatic scene unfolded Tuesday in a 90-foot-deep pit to the east of Seattle Center. A five-foot-thick concrete wall came tumbling down, revealing a slowly rotating cutterhead five stories tall. 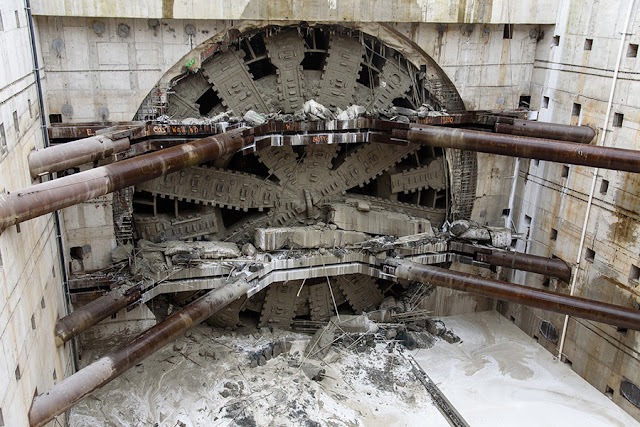 This was Bertha, the SR 99 tunneling machine, completing her 1.7-mile journey beneath Seattle. Bertha’s cutterhead made its appearance near the Seattle Center on Tuesday, April 4. Crews from the contractor Seattle Tunnel Partners began mining around 8 a.m. on Tuesday, breaking through the concrete wall around noon. 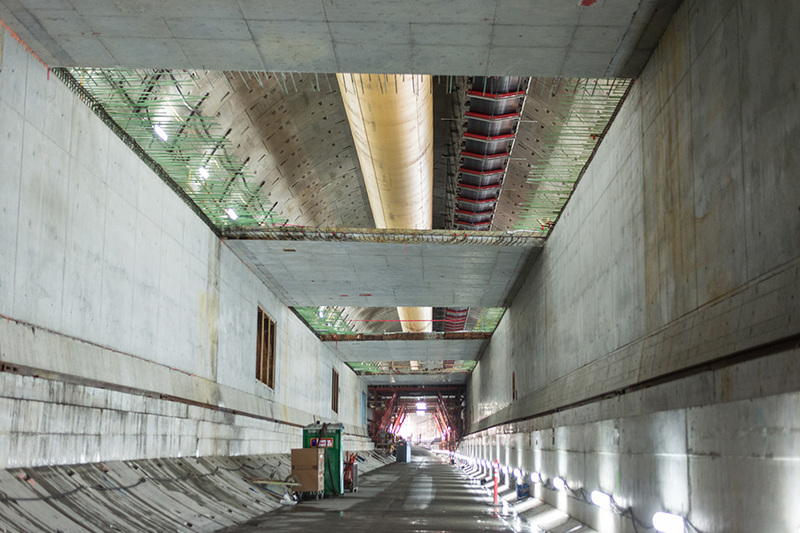 We shared updates from the scene on Twitter, Facebook and Periscope, and hosted a livestream on the Alaskan Way Viaduct Replacement Program website and here on the blog. (The traffic overwhelmed our servers for a time; across all our channels, nearly a half million people tuned in to witness the event). 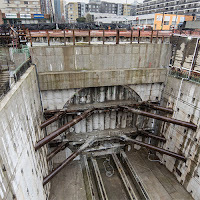 Bertha has been building the new SR 99 tunnel as she mines, erecting a 6.5-foot-wide tunnel ring and then pushing off that ring to mine forward (watch her build a ring). This new tunnel will carry SR 99 through Seattle, replacing the Alaskan Way Viaduct which is old and vulnerable to earthquakes. Once the tunnel opens, the viaduct will be torn down and a new Alaskan Way surface street built in its place, which will provide connections between SR 99 and downtown Seattle (this map shows how common trips will look when work is finished). With tunneling complete, Bertha now sits at the north end of a 9,270-foot tunnel stretching from the stadiums to the Seattle Center area. In the coming weeks, STP will move the machine into its final position in the disassembly pit. Then the machine will be cut up and the pieces loaded onto trucks and hauled away. Some parts of the machine will be recycled while others may be reused. While Bertha tunneled forward, crews working behind her have been building the structure of the highway inside the tunnel. These walls and decks will form the tunnel's double-deck highway, plus the ventilation, maintenance and emergency exit corridors on the sides of the roadway. When complete, the tunnel will have two lanes in each direction, plus an 8-foot shoulder and a 2-foot shoulder on either side of the roadway. Crews have been construction the roadway of the new SR 99 tunnel behind the Bertha tunneling machine. Building the roadway is one of four big steps remaining before the tunnel opens to traffic, currently scheduled for early 2019. The tunnel will have a complex set of interconnected systems to ensure the tunnel is safe and functional, including ventilation, fire detection and suppression, security and lighting. Once everything is complete, these systems will be thoroughly tested and its operators trained. You can read more about these steps on the program website, which will continue to provide updates as we get closer to opening the tunnel to traffic in early 2019. The contractor Seattle Tunnel Partners began mining around 8 a.m. this morning. The tunneling machine Bertha will mine through the five-foot-thick concrete wall of the disassembly pit, an effort that is expected to take several hours. Crews will then stop to remove the braces supporting the wall (visible in the livestream feed), work that will take several days. After the braces are removed, crews will advance the mining machine until it is in its final resting place inside the disassembly pit. Below is footage of Bertha's breakthrough, captured by a drone flying above the disassembly pit. 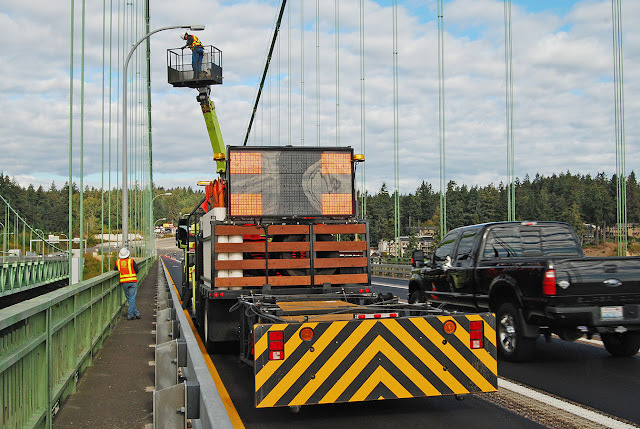 It's hard to describe how it feels when a vehicle zooms by you in a highway work zone. You hear the vehicle before you see it and then you're also buffeted with a burst of wind as it passes just a few feet away from you. There are cones, barriers and warning signs, of course, but if you're not used to it the vehicles still feel WAY too close. from moving traffic. Please slow down and be extra alert when moving through work zones. For many of my colleagues, though, this is their daily office. And, unlike me, they live with the knowledge that one second's distraction by a driver can cause their injury or even death on any given day. Every worker I've spoken to can reel off a list of near misses, and some have been injured as well. We work very hard to keep these workers safe with equipment and procedures, but we still see far too many crashes in our work zones. in work zones, but we still need the public’s help to ensure everyone is as safe as possible. In 2016 alone, there were 1,790 work-zone related crashes on our state highways, including 11 deaths and 523 injuries. Nationally, there's an injury crash in a work zone every 14 minutes. That's why we're going to spend the next month sharing Work Zone Safety messages and information to help all of us be safer on our roads. The effort kicks off this week with the National Work Zone Safety Week, and continues throughout the month. The centerpiece of the month-long campaign is our annual Worker Memorial Event on April 13 in Olympia. 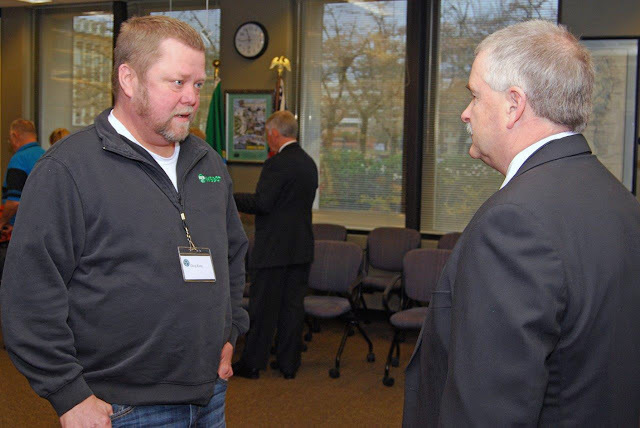 The ceremony is a chance to honor the 60 WSDOT workers who have been killed on the job since 1950 as well as recognize the many others who have been injured or had near misses while working to keep the traveling public safe. It's a humbling experience every year. So, what can you do? Please Slow Down and Pay Attention whenever you're in or approaching a work zone. The top three causes of work zone crashes in our state are distracted/inattentive drivers; following too closely and speeding – and all of these are preventable. So, the next time you drive by workers on a highway, think about what it would be like standing so close to oncoming traffic. Slow down and follow directions. Please also be alert for other drivers who may not be paying attention and can suddenly slam on brakes in front of you. Please help us keep everyone – our workers and all the drivers and passengers on the road – safe in our work zones. We want everyone to return home to their families at the end of each day. Two individuals were rescued from a downed aircraft in the Olympic National Park this evening near Mt Jupiter and have been airlifted for medical treatment. 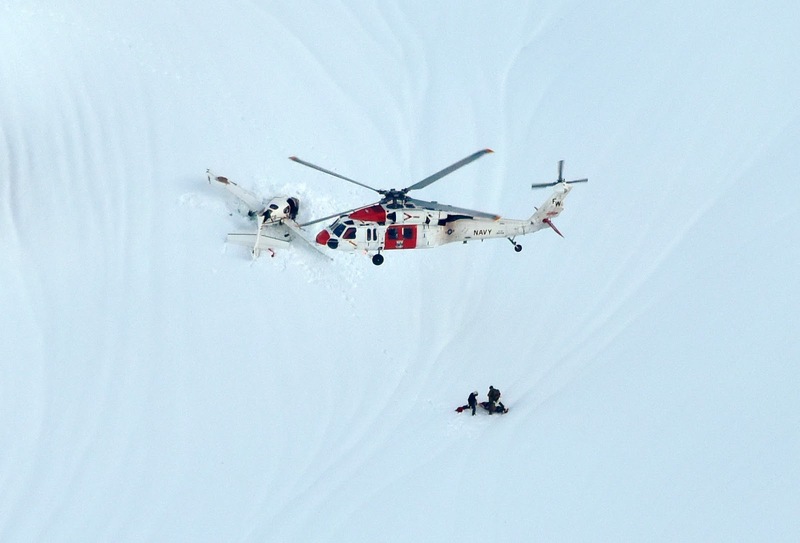 The Cirrus SR22 aircraft went down in the snow covered wilderness and search and rescue officials were alerted at 3:48 p.m. Sunday, April 2, when the plane's Emergency Locator Transmitter activated. The signal was detected by satellites and the distress message was forwarded to the Air Force Rescue Coordination Center at Tydall AFB in Florida, who alerted the Washington State Department of Transportation. The occupants of the aircraft were also able to alert overflying commercial aircraft on the emergency frequency. Search and Rescue personnel from Naval Air Station Whidbey Island Search and Rescue were able to locate the wreckage with the help of a search aircraft from Washington Air Search and Rescue, who tracked the distress beacon's signal. The Navy crew then lowered rescuers to the ground to locate, access and hoist the downed flyers up and onto the rescue helicopter and transport them to Harborview Medical Center in Seattle. Exact details about their injuries are not available at this time, but they were described as minor and not believed to be life threatening. At this time we still do not have the names of the pilot and passenger or know the purpose of the flight. The Federal Aviation Administration and National Transportation Safety Board are already mobilized and will begin their investigation to try and determine what caused the plane to go down. This concludes WSDOT’s involvement in the search and recovery mission. Further information – including the pilot’s and passengers names – will be released by the FAA. Media can contact the FAA PIO at ian.gregor@faa.gov. Details about the site will be handled by Olympic National Park officials, who can be reached at 360-565-3000. Search crews have located the missing plane and the two people who were onboard have minor injuries. Rescue crews are still working to reach the plane. We have no further details about names or other information at this time. The Washington State Department of Transportation is searching for a missing plane in the Hood Canal/Olympic National Park area near Brinnon. At 3:48 p.m. Sunday, April 2, an emergency locator beacon signal was received. At roughly the same time, an aircraft contacted Seattle air traffic control reporting hearing another aircraft making a mayday call. The search is being conducted with an aircraft from Washington Air Search and Rescue as well as a US Navy helicopter crew out of Whidbey Island. They are searching the area of Emergency Locator Transmitter signals. WSDOT also is coordinating with the Jefferson County Sheriff’s Office and Olympic National Park officials. Brinnon is approximately 60 miles north of Olympia on the Olympic Peninsula's east side, along Hood Canal on the eastern edge of the Olympic National Park. At this time details about the plane and pilot, and any occupants onboard, are not being released because it is unknown. No aircraft have been reported overdue at this time. Updates on the search will be posted on this blog. WSDOT, by statute (RCW 47.68.380) is charged with the coordination and management of aerial search and rescue within the state. The agency works in conjunction with volunteer search and rescue groups, law enforcement and other agencies, such as the U.S. Navy, in carrying out such searches.